Drink, will the Boks on to survive, bloody idiot. I did cheer for them right at the end, I admit it. There may be a meeting called under some urgency Sunday lunchtime to discuss the possibility of my estrangement. At least from future family rugby occasions anyway. The rivalry needed it, though. The only bum note was the sighting of a symbol from a past shameful political era. A disgrace- there are no other words. A away victory over the old foe, the All Blacks. That’s got to be great for rugby as a whole. If lots celebrate then Steve Hansen and co should take it as a compliment, because it just shows how dominant and extraordinarily skilled the All Blacks have been over ten years. So how did the Springboks do it? Gareth Dinneen and Steve Prescott will have a well-researched, definitive answer for that on their superb ‘1014’ rugby show on Sky. From an off-the-cuff first viewing it looked as simple as waiting for the All Blacks to come to them. That means they invited the All Blacks to break their defensive screens. The ‘close down the space and time’ lines they kept would have unnerved the ABs. That appeared to be their focus and they didn’t distract themselves from it by trying to out-pass and out-run the opposition. The attack wasn’t an afterthought- and they did score some delicious tries- but the line of thinking seemed to be, we’ll attack when we get within range with numbers on the short side when the chance presents itself (there is usually less space for something to go wrong on the short side as a benefit). But we’ll not waver from a tight defence and implore each other to keep getting up and to crowd them. It’s kind of what the B & I Lions did to us last year. There’s no doubt it was a completely intentional strategy. And a very smart one. 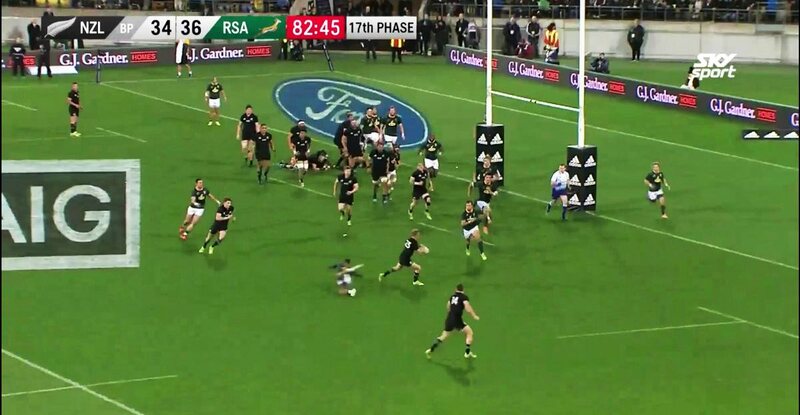 The Boks’ scrum was also better than ours- one more All Black weapon negated. And when you think of how many great set-piece tries our backs have conjured up over the past three seasons in particular, then that was really significant. And not much mentioned. It was also to the All Blacks’ favour that they played against fourteen men for most of the final ten minutes. That they couldn’t find a way to make that pay, nor think of a way to set up for a drop goal, shows that no matter how skilled or athletic a team is, their response to pressure is one dynamic that can never be practised. It was the second high-profile defeat in two years at the Cake tin, too. And a fifty-nine point turnaround from last year’s corresponding fixture. The glorious unpredictability of sport.